On Wednesday 17 October 2018 the UNIS Hanoi varsity tennis team headed to the hosts Canadian Academy School, Kobe, Japan to compete in the APAC tournament. This year 6 schools participated: HKIS, SFS, SSPD, CA and WAB. The matches were played off the school site and an outdoor venue with Savannah grass courts. UNIS Hanoi started with a match against SFS (Korea). With it being first match it was a battle against opponent and nerves! We lost 1-6, our win coming from our boys doubles. We lost our remaining matches on day one 2-5 vrs SASPD (very creditable wins for Serena and Dao) and 1-6 against WAB. Day 2 was an early start with another packed day of matches. 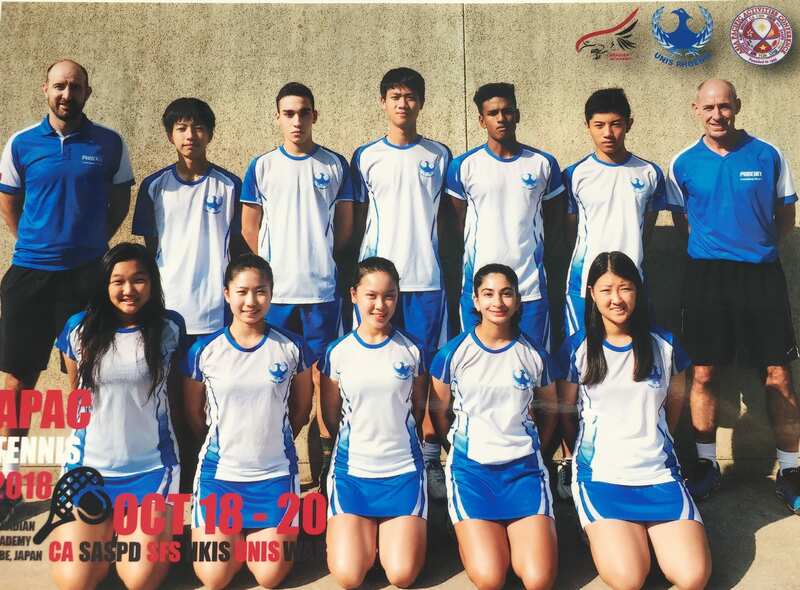 We started with a match against the strongest school HKIS. Despite some valiant efforts we were unable to pick up any wins and lost 0-7. Next up was the hosts CA. We won this match 5-2. Wins coming from; Dao, Gai, Jacob & Kevin, Serena and Miki and Taku. This match completed the six school round-robin and then depending on your placings the first two days was where you were seeded as we went into the individual competition. Final day (3) and by now everyone is playing their respective individual event. Nguyen Dao had our highest individual placing just missing out on a medal coming 4th. He was in fact very close to making the final had some key points gone better his way. Ultimately the competition was extremely good and it’s good to be aware of the level and standards we wish to aspire too. The finals produced excellent tennis to watch, girls event was won by WAB and boys event HKIS. Overall fantastic event well organized by the host school CA. Great experience for our players with Jacob being our only senior and therefore ineligiable next year. Some of our players now have 2/3 yrs experience so that will hold us in good stead. We know we have to practice more often and play more matches so hopefully that’s something we can commit to all year round now. This entry was posted in APAC, Sports, UNIS Tennis Academy by tintuc. Bookmark the permalink.